I really enjoy cozies and love a good book that is over way too soon. This wasn’t one of them – it’s an ok read, but it seemed I’d never finish it. Some pros: a couple of the characters really stand out (Birdie and Cass), there were a couple of knitting terms I wasn’t familiar with so looked them up. Cons: someone should have proofread the book for editing errors (can’t list them because I didn’t keep track, but they were quite obvious at the time), twice the author referred to fibers being ‘woven’ into yarn when they are actually ‘spun’ (cloth is woven), these people sure ate good and the story at times seemed more about the food than anything else – it even overshadowed the knitting aspects, I kept getting lost with all the characters (they weren’t developed enough to remember them or for me to care enough about them). I’ll keep the rest of the books in the series on the ‘back burner’ in case I decide to give the series another try, but for now I will be trying other authors. I agree with another viewer who stated that there was more interaction with the characters getting together to eat dinner with each other and the descriptions of cooking than on the mystery itself. This is a book series that you really have to read from the beginning in order to know who everyone is. The character Nell can get a bit much as times, for me. She just seems to find her life in everyone else and a small interest in knitting. I like Izzy way better. I read the first one, but quite a bit of time went by before my interest was high enough to read this book. On the plus side,the harbor town they live is very well drawn and does make you want to live there. Hmm...I'm not entirely sure why I keep reading these books. The writing is okay, and the editing (both for knitting content correctness and basic English grammar) is terrible (FYI, "led" and "lead" are not the same word), but the stories are cute. The same comments I made about the first book regarding food, extra characters, etc., hold true for this book as well. I'll probably read the third because I already have it, but I don't think I'll buy any more. Knitting fiction and mystery has sprung up all over the place lately. All I have to do is see that knitting is involved and I'll pick up the book to read it. This one had a fairly captive plot but overall it didn't hold my interest well. The characters didn't seem to come life as in other books. The mystery itself had a nice little twist. This time the ladies in the group of friends and knitters have found a new friend, Willow Adams who has recently arrived in town. She is young and full of secrets but when she is a suspect in the murder of an artist the group rallies around. One of Willow's secrets is that she is the daughter of the artist who was murdered. The police discover that she will inherit everything from the artist which moves to the top of the suspect list according to the police. Nell who wants to help Willow enlists her fellow knitters to help Willow. The book was a quick easy read. I hated this book. I read “Death by Cashmere” because I love knitting, I love Cape Ann, and I love mysteries. I didn’t love that book, but I got “Patterns in the Sand” because of the above reasons and because once I start a series, I want to finish it.I think maybe “cozies,” a term I learned from reading the reviews here, just aren’t for me. The characters spend an inordinate amount of time discussing how “scrumptious” yarn is and experiencing paroxysms of joy when a new shipment comes in. I’ve never met someone who behaves like this. I found the details the writer has chosen to include off-putting. The yarn, to begin with, but at irrelevant moments, people’s clothes or interior décor are described in detail. And this was more in the last book than this one, but why are all the ingredients in the food listed? Yet there are seemingly dozens of characters I can’t keep track of because I don’t know much about them.I could never get past the fact that Willow breaks into the yarn shop and hunkers down for a nap in the display window rather than one of the couches or chairs that are present and none of the main characters seems to think she’s a weirdo because of it. I get that it’s a trusting group of people, but really this is not a normal response. This book failed to get me interested in the murder. I will not be continuing the series. I have visited Sea Harbor, Maine again in this second book of the Seaside Knitters Mystery. Only this time there were 2 murders and it turned out to be one of the people living in Canary Cove! Unheard of!I found that this book was much better than the first and now I'm looking forward to the next one in this series. It is a good summer beach read, fast moving and just plain good stuff.Sally Goldenbaum has other series that she has written. I started last night "Murders on Elderberry Road" A story about the Quiltters Club in Kansas. I was able to get to chapter 3 before my eyes closed and I don't remember any more. She is a good writer and I am enjoying spending time with the nice people that she has invented. Look for Sally's books for a beach novel to read on a nice summer day. This one was loaned by a friend, and I read it on vacation after my Kindle broke. I won't be reading any others in the series. It was a tedious read, but I finished it. Typos throughout were annoying, as were misuse of "lead" for "led" and other grammatical errors. The first victim's name is Aidan, not Nick, as stated in the blurb here.I love knitting, and I love mystery novels, but this one was just too contrived. The characters were sympathetic but not developed enough for me to care what happened to them. There was some good writing, but overall I'm going to pass on this author. Too many other good books out there, so little time for them all. I wish I could give this book 2.5 stars, because it was better than 2 stars, but not worthy of 3. I just never found myself getting attached to the characters. Perhaps the issue is that it was a second in a series, but usually with this kind of cozy mystery you don't necessarily need to read them in order. I won't be perusing any others in this series. It was fine, but not really anything to write home about. I lost interest and stopped reading about a third of the way through. I'm not entirely sure why, but I had some trouble keeping all the artist/shop owner characters straight in my head. And it seemed like much of the "action" took the form of conversations at social gatherings. The plot and characters just didn't pull me in enough to keep going. A quick read, one of many (often mystery) novels about groups of knitters. I often feel, as I did here, that knitting is not central to the story. The story is not about the bond among knitters if all they do is pull out their knitting at any free moment or, worse, fondle the yarn as they walk through the store. After a promising debut (i.e. better than Maggie Sefton) this second in the series shows it's flaws. The mystery isn't bad, and there is plenty of fiber talk, but with so many characters, it's hard not to notice when every single person speaks the same way. No characterization whatsoever, and while some would argue that is okay for a cozy, I'm not one of them. Stumbled on this series and find, with this second book, I simply enjoy the characters, the location and the mystery - very likeable and easy, pleasant read, that features knitting and makes my heart smile and look forward to picking up my needles. To be fair I actually only got through half of this book before I gave up and realized life is too short to waste time on books you don't really like. I enjoyed reading this book, just as I enjoyed the first one, Death By Cashmere. I like all of the main characters because they are relatable. What piqued my interest to read it is because I love the idea of a knitting group of friends who are the town super sleuths. I love a good mystery but do not care for the dark side that some of the murder mystery books have these days. This is a charming read if you like a whodunnit mixed in with good food,family/friend fellowship, a coastal community and a look at the inside of the world of a yarn shop. I look forward to reading the next one. Just okay...seems a little choppy and disjointed. I didn't think there was enough to indicate the character of the person who was eventually revealed to be the murderer. It was not a character I cared about....positively or negatively. This was a good story that kept me interested the whole time. Twists and turns that didn't reveal the mystery answer until the very end! Love to read mysteries, so keep trying to find other authors to read in this genre. This is an okay series. Tried this second book and no better than the first. Nell is a boring main character and Izzy remains a background player. Mystery and art!My second Goldenbaum read and I liked that this mystery more than the first one. Can absolutely feel the yarn's texture and smell the sweet salt summer air as you turn the pages! I remember in the first book I was a bit confused as to the voice of the narration- Izzy or Nell. I didn't feel that this time. Also the repeated declarations of losing their summer or needing to get their summer back in the first book are gone- only stated once, I think. There were still a number of editing mistakes but that can be overlooked.I enjoy the lovely location, the knitting, descriptions of the food they're enjoying. Good story, I had some suspicions, some of which were right :) The rating may be more like 3 1/2 stars. I will continue to read this cozy series. I decided to read this book because a) I enjoyed the first in this series, and b) it takes place in a town in Cape Ann, Massachusetts, and we would be spending part of our vacation in a couple of Cape Ann locations.One regular, quiet evening in the town of Sea Harbor, Izzy Chambers, the owner of the local yarn shop, gets a call from the local police saying that someone has died in her store window! She arrives to see what is happening, and it turns out that the young woman is alive, but that she had broken into the shop and fallen asleep. Her name is Willow Adams, and she came to town because a while back, Izzy and her aunt Nell had seen some of Willow's textile art and had sent her an e-mail saying how much they had admired it. Izzy had said if Willow ever came to Sea Harbor to let her know, she would love for her to teach a class or something.So that's weird enough - why didn't she let them know she was coming, etc. ?Then shortly after, on a night when the local artists have their open house events, Aidan Peabody, a one of the artists and a force in the town, dies from having his drink poisoned. Who did it? Why? There are several people who he had conflicts with, but to the locals, it's hard to believe one of them was the killer. Willow becomes a suspect.After that, one of the gallery owners dies. At first everyone thinks it is suicide, but they cannot figure out why he would kill himself Then it's learned that it was murder. So two murders in the small town in a short time - what is happening in normally quiet and lovely Sea Harbor?This was an enjoyable read, perfect for a vacation. It was interesting enough to keep me turning the page, but did not require intense, singular concentration to keep track of things. 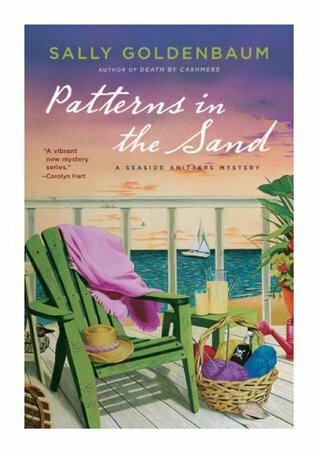 “Patterns in the Sand” is the second book in the Seaside Knitters Mystery series by Sally Goldenbaum. Set in Sea Harbor, a small Massachusetts coastal town, the series revolves around main characters, knit studio owner Izzy, her aunt, Nell, lobsterwoman and boat captain Cass, and Birdie – a spitfire of an elder stateswoman. They are a handful on their own but when you put them all together with a good murder mystery at the center – their unstoppable. The second book opens with Willow Adams, a young fiber artist from Wisconsin, arriving in town. She literally crashes the window display at the knitting studio and sleeps with the wool. She’s found by the police and quickly embraced by Izzy and the rest of the gang. It turns out, Izzy had invited Willow to teach a fiber art class at her studio if she was ever in Sea Harbor. Of course, Willow has a secondary motive to be in Sea Harbor but that doesn’t come to light until local gallery owner Nick Peabody is found dead in a community garden behind his gallery on the biggest night of the summer for the artists at Canary Cove. All I’ll say is Nick and Willow are connected in a way that is both expected and unexpected, depending on how long you’ve been a mystery reader. What’s not surprising is how quickly Willow becomes a suspect in Nick’s death and how quickly the knitters turn amateur sleuths to clear her name. Cass’s brother, Pete, who had a semi-significant role in debut novel is back for this one. Looks like, there may be a happy ending for him beginning to take root. Keeping my fingers crossed. Love this series. Birdie is by far my favorite. She’d be a blast to hang out with in ‘real’ life. Sea Harbor, Maine, is the home for numerous artists and their stores in the Canary Cove Art Colony, where an art festival is held the first Sunday of every month. Izzy's Seaside Knitting Studio is the gathering place for the ladies in this story. Then Willow Adams makes an appearance by breaking into the shop and falling asleep in the front window with the shop's cat, Purl. She's come to town to show her fiber art, or so she says.When one of the town's local shop owners dies in a mysterious way, Willow becomes a suspect when it's found that he is actually her estranged father. The ladies in town find it difficult to believe that this waif of a girl could be a murderer, and decide to investigate for themselves. In the process, there are lots of gatherings and gossip.I love mysteries and cozies. I'm a big fan of knitting and food. I really wanted to love this book but it just didn't ever really excited me. It was a decent story if there were not so many more great cozies to read. My problems revolved around the numerous gatherings that really weren't that interesting. The one time focused on knitting caps for cancer patients really caught my interest, but that was about it from the knitting front. There are so many books in this series, I'm going to assume that this series gets better with future books. Knitting pattern and information about caps for cancer patients in the back of this book, saved this one for me. Will give this series another try. When I started this book, I was surprised it started with a cat in the window of a knit shop telling what it saw outside. Then a stranger in town climbs in a window and curls up with the cat. From there you find a mystery all through the book using terms of knitting to explain how a puzzle is pieced together to learn all the details to find the pattern. You find yourself with one murder and then another in a town who has not endured this before. Now I know very little about knitting but enough to enjoy the connection. First you think it is one person and then another but never the one the town wants to accuse. When you get to the end of the book you find where the book got it's title and what patterns in the sand stands for. I found the book intriguing and believe me it kept my attention as it was hard to put down. I found myself pulling for Willow and the person I thought who done it didn't. Also living in a rural area I could relate to a place where people never locked their doors. But now even here that no longer holds true. Highly recommend this book even to those who don't understand knitting. PATTERNS IN THE SAND is the second novel in the Seaside Knitters cozy mystery series by Sally Goldenbaum. I love the small town, fishing village setting of Sea Harbor, Massachusetts. Izzy Chambers owns the local knit shop and one evening she receives a telephone call to hurry to the shop as there is a dead girl in her front window. Hurry and get there before the local cops mess up the pretty yarn! She arrives to find the young fiber artist Willow Adams has fallen asleep in the window. Where did Willow come from? How did she get into Izzy's shop? Sea Harbor is getting ready for it's Art At Night festivity and before all the questions about Willow can be answered the body of Aidan Peabody, one of the gallery owners is found ... very dead. Guess who inherits Aidan's gallery and home? Yes indeed ... Willow! I read the novel in one day. I enjoy a good cozy set by the water and one that talks about yarn. This one had both. Along with the characters that I've enjoyed getting to know ... PATTERNS IN THE SAND is a winner. Off to read number three in the series while I take care of my cold! Good summer read!